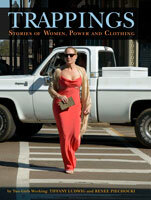 What's another great way to support Trappings and future Two Girls Working projects? Shop at our Shop! Below you'll find a sampling of what's for sale at events and lectures. Feel free to contact us with any questions. 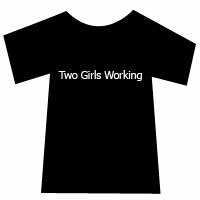 Two Girls Working were invited by Douglas Light, editor of Epiphany, to develop an artist project of Trappings for publication in the Summer 2005 issue. The project featured an essay, excerpts from interviews in each region of the United States, and a series of Trappings postcards. 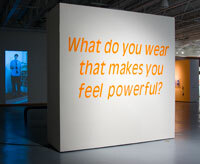 Trappings: Stories of Women, Power and Clothing, is a traveling exhibition that features artworks created from more than 500 women's responses to the Trappings interview question: what do you wear that makes you feel powerful? This brochure features an essay by Patricia C. Phillips commissioned by the Regina Miller Gallery of Carnegie Mellon University for the launch of the exhibition. 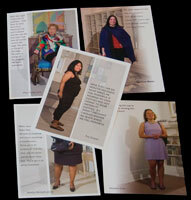 Two Girls Working designed a public print installation for Pittsburgh city buses, featuring images and text of women interviewed in Pittsburgh. The public art installation was selected by artist Mary Miss for inclusion in Americans for the Arts' 2006 Year in Review. This artwork includes the series of framed bus cards as well as documentation of the installation and publicity postcard. 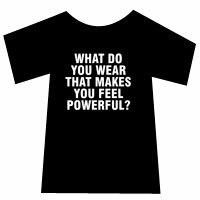 Trappings: Stories of Women, Power and Clothing - a multi-media art exhibition available to museums, galleries, and community spaces. The exhibition debuted at the Regina Gouger Miller Gallery at Carnegie Mellon University in Pittsburgh, PA in July 2006, with support from The Heinz Endowments and The Pittsburgh Foundation. Its components are designed to fit into a variety of gallery and museum spaces. To view past installations, click here. More information about the traveling exhibition. Contact us to discuss the rental schedule and other details.